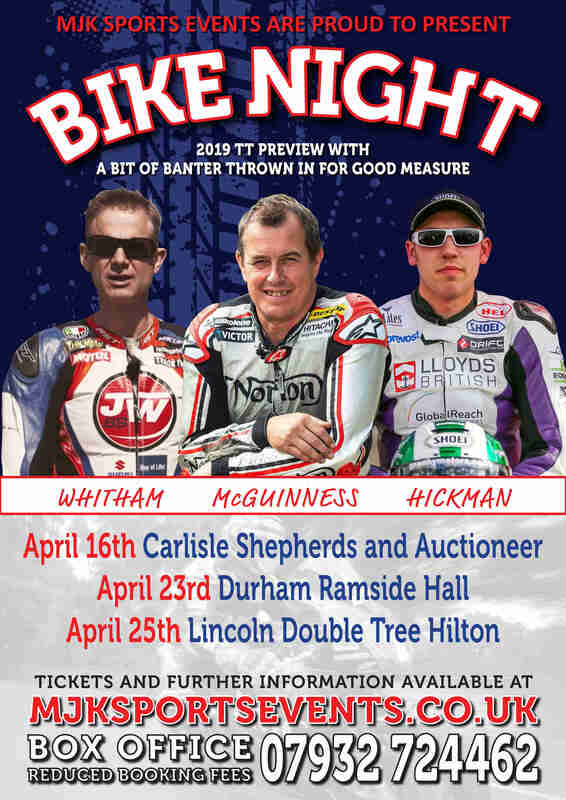 SPORTING LIFE STORIES in association with MJK SPORTS EVENTS are proud to bring you BIKE NIGHT with McGuinness, Whitham and Hickman. A 2019 TT preview OBVIOUSLY with lots of banter thrown in for good measure. A successful racer in his own right Whit now works in the media and although we say so ourselves the man is simply brilliant. We have worked together for many years and the style and banter in his interviews is a joy to behold for fans of motor cycle racing. The Bike Night format is very successful and a major part of that is down to James. He has the benefit of racing at the TT and as always will no doubt interject with his own hilarious stories. Another regular with MJK, John is literally a TT legend with 23 times wins to his name a round the Isle of Man course. Popular with the fans his on stage chemistry with Whit and fellow guests is hilarious and his knowledge of the TT and bike racing in general is a treat to listen to. Always the last man to leave the time he has for his fans is fantastic to see and he always brings one of his bikes along too. Hicky is new to the Bike Night series but a very welcome addition. A 2 time winner at the TT many good judges see him as the next TT superstar. Also a regular at the front end of the British Superbike Championship and another who likes the banter. We can not wait to work with him and hear his thoughts not only on the 2019 TT but from his career so far. £30 Entry and show and picture with all three guests that is printed on the night. £79 LTD to 20 guests. Entry and show and a private 30 min meet and greet with all three guests inc complimentary food and drinks.